I am in the final stages of decorating, sprucing up and preparing for our first veranda party on our newly remodeled back yard, drive way and front entry. I'm interested in a patio heater since it's not quite warm enough to be outside all night. I think a patio heater would allow more outdoor entertaining through the season and provide potential light, decor and some have beverage stands for the adult beverage. 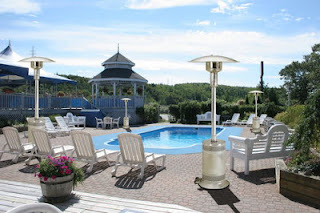 Patio heaters come in various sizes (free standing or table top) and in a multiple variety of colors. I'm going to start with one patio heater and then see if I need to invest in a second heater. I especially prefer the outdoor heaters that don't require any electricity and can be moved to accommodate various furniture arrangements. I also need to purchase a new mailbox (ours has been hit three times by construction companies and the utility company) but I'm hesitant if I should DIY a stone mail box or purchase another inexpensive one if the case that we may have another causality. 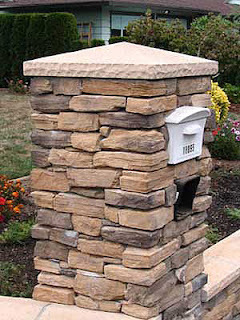 I love this mailbox from Outdoorimpressions.net and I think I can create this. I think it would look nice with our new stone pavers and since our home is stone it would look very classic. Has anyone built their own mailbox and would recommend trying it? I think a custom address plaque would look great with a new Stone mail box. I live on a busy street so the address plaque would come in handy as most of my visitors struggle to know which is my drive way. I keep everyone updated as I put the final touches on my outdoor home projects.